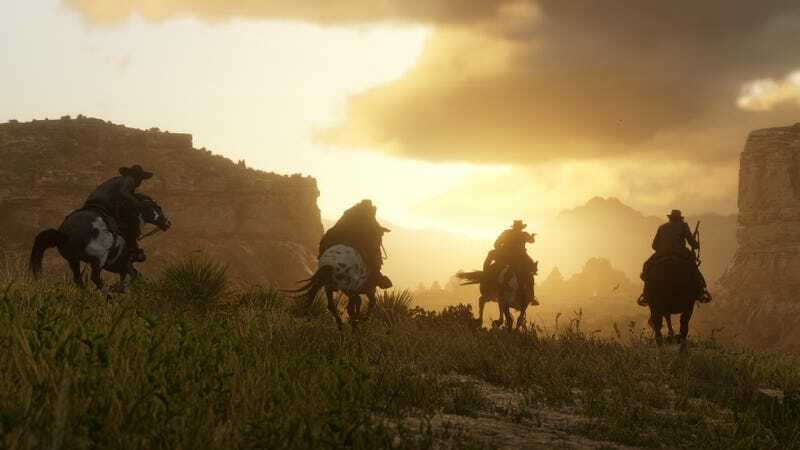 The multiplayer component to Rockstar’s new Western will be out this week, the developer said today, promising a beta for Red Dead Online that will launch on a staggered schedule for Red Dead Redemption 2 owners starting tomorrow. Tuesday, November 27 - Anyone with the Ultimate Edition of Red Dead Redemption 2. Wednesday, November 28 - Anyone who played Red Dead 2 on launch day (October 26). Friday, November 30 - Anyone else who owns the game. With the gameplay of Red Dead Redemption 2 as its foundation, Red Dead Online transforms the vast and deeply detailed landscapes, cities, towns, and habitats of Red Dead Redemption 2 into a new, living online world ready to be shared by multiple players. Create and customize your character, tailor your abilities to suit your play style, and head out into a new frontier full of things to experience. Rockstar is calling this a beta that will eventually morph into a full release, so expect bugs, strangeness, and lots of changes—not unlike GTA Online when that first launched in 2013. Good luck to all of you intrepid aspiring gang leaders, and may you fare better than Dutch did.